Imagine being the one, imagine being that player that everyone pins their hopes on, the player that people expect to produce brilliance. With this pressure comes the opportunity to change everything, to create moments of sheer genius that are remembered forever, to light up the pitch, inspire a nation, and Illuminate the Game. The Illuminate Pack brings together PUMA brand-new iterations of the FUTURE and PUMA ONE in a stunning new iridescent colorway and graphic makeover that reflects that pulse of energy that surges through the minds of football geniuses as they receive the ball and create those game changing moments of excellence. The FUTURE 2.1 carries a subtle membrane graphic that symbolizes the mind of the creative players that invent play with flair and instinct, whilst the PUMA ONE has an analytical geometric graphic that mirrors the minds of those players that read the game ahead of all others, delivering those pin-point, defense splitting passes with perfection. The FUTURE utilizes PUMA’s adaptable NETFIT technology was introduced to football in the form of the FUTURE 18.1 and made waves on the pitch. For the FUTURE 2.1 we have refined this concept and improved it in every detail. Each lace hole in the NETFIT technology is more closely spaced and applied over a larger area of the upper for even more lacing possibilities. In the strike zone the NETFIT is covered and protected by a TPU skin, the vacuum process that is applied to this area creates a strong x-ray of the net that adds to the grip and touch of the boot. To improve the overall fit and feel of the boots the NETFIT upper has been fused to the evoKNIT sock and striking zones to create one Form-fitting textile base layer, bringing the wearer a snug-fit whilst making sure the foot is closer to the ball on impact for that perfect touch. The evoKNIT sock has been further enhanced in the FUTURE 2.1 by updating the socks specifically placed cuts and ribbing textures, providing a secure fit around the ankle that allows the wearer to react quickly and remain agile. The super lightweight and reactive RAPIDAGILITY outsole is retained and contains a mix of conical and bladed studs that are designed to bring the best results in traction and stability. Perfect for those quick turns of pace, and moments of quick footed brilliance that will leave your opponents in a twisted heap. The FUTURE 2.1 will be worn by our most instinctive and unpredictably creative players on pitch. 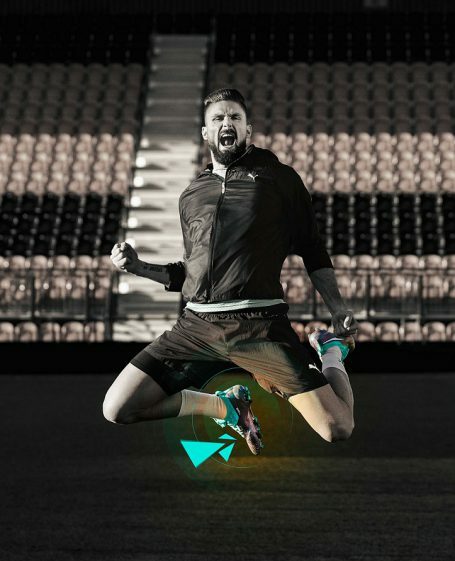 REACT: evoKNIT sock and Form-fitting textile base provide support for lightning on-pitch reactions. The PUMA ONE was designed to enhance every aspect of your game. From the strike, to the speed, to the touch. Leaving nothing to chance the PUMA ONE 1 revolutionizes this approach with a complete progressive update. For the perfect FEEL the leather remains the super soft and thin K-Leather which has been applied only to the key striking area of the boot to help reduce its overall weight. Perfect touch is a key attribute every player desires in their play and this has been addressed by creating 3D dots that lie underneath the K-Leather vamp further enhancing the overall FEEL and grip on the ball. The FIT has been taken to New Levels by combining our new FUSEFIT technology to the supportive evoKNIT sock resulting in more lacing options for better overall comfort, lockdown and agility. The FAST is pushed further by updating the lightweight RAPIDSPRINT outsole reducing the overall weight of the boot resulting in increased top speeds. The new stud configuration is now combined with an external heel counter, designed to provide stability and aid quick turns and bursts of pace, altogether offering our players a more agile and reactive boot. For players with real ability, pure class, and perfect play there is only ONE. The Illuminate Pack will be worn by PUMA’s impressive roster of global players as they step up to Illuminate the Game and reach New Levels on the world’s biggest stage this summer. These players include, Antoine Griezmann (FRA – FUTURE), Sergio Agüero (ARG – PUMA ONE), Olivier Giroud (FRA – PUMA ONE), Marco Reus (GER – FUTURE), Nacho Monreal (SPA – PUMA ONE), Diego Godin (Capt, URU – PUMA ONE), Giovani Lo Celso (ARG – FUTURE), Rui Patricio (POR – PUMA ONE), Jonathan dos Santos (MEX – PUMA ONE), Stephan Lichtsteiner (Capt SWI – PUMA ONE) and Makoto Hasebe (Capt, JAP – PUMA ONE). PUMA will also be well represented as kit suppliers of Uruguay, Switzerland, Senegal and Serbia at the tournament.